The Fishtown Neighbors Association created the “Feed the Fish” program, which asks residents and business owners to adopt trash cans covered with fish heads. On windy days, Beth McConnell has to be careful walking on her South Philadelphia block. "I've had to duck and gotten hit in the head with flying debris," said McConnell, policy director for the Philadelphia Association of Community Development Corporations. To the north, a neighborhood project that brought more than two dozen trash cans capped with fiberglass fish heads to Fishtown is viewed as a prototype for a city plan to clean up by getting residents and business owners to care for trash cans on city sidewalks. Volunteers in Fishtown agree to partner with their neighborhood association, adopt trash cans, buy trash bags, and take responsibility for emptying the bins and putting out the garbage on trash day. But 30 whimsical cans in one neighborhood stand no chance against Philadelphia's pervasive litter problem. On a recent afternoon, a cardboard box that once held a dishwasher sat empty in the roadway of Girard Avenue, gliding in the wind across the pavement to rest against a parked pickup truck at the corner of Crease Street. In side streets, sunlight reflected off piles of trash. A few blocks away, three fish-headed cans waited open-mouthed for garbage. Some city cans sat ready too. 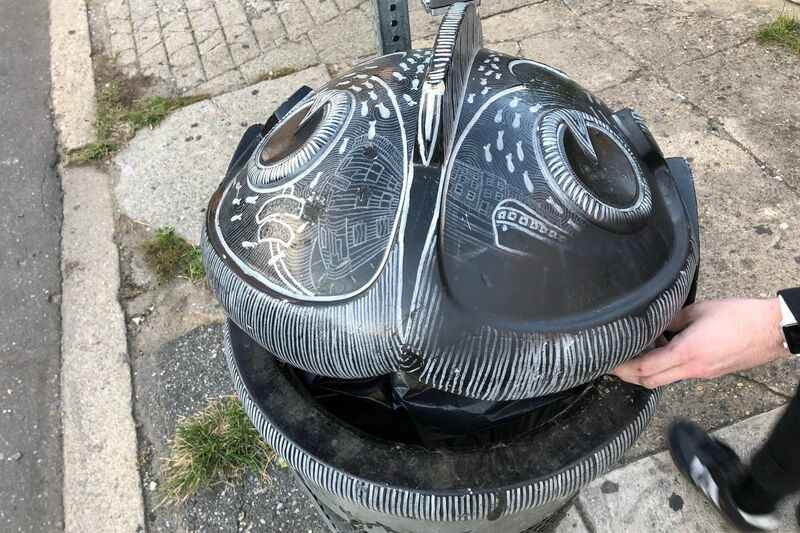 The Fishtown Neighbors Association created the "Feed the Fish" program, which asks residents and business owners to adopt trash cans covered with fish heads. Tensions have simmered for years between neighborhoods and the city over the placement of city trash cans and the question of who should be responsible for maintaining and emptying them. While the Streets Department's sanitation division works with a $100 million budget, city officials said that with 1.5 million residents and only 49 SWEEP officers in charge of enforcing trash disposal laws, the city needs residents' help. But while the city's Zero Waste and Litter Cabinet sees Fishtown's program as a model for fostering community buy-in, Fishtown's volunteers are skeptical that a program they started as a "Band-Aid solution" will be able to grow enough to make a difference city-wide. Some residents who initially signed up to take care of the cans dropped out, because they were too much to handle. Last week, City Council unanimously passed a bill aimed at making it easier to get more privately maintained receptacles on the streets. The amendment to the city code encourages agreements between the Streets Department and property owners and members of community groups who would agree to place trash and recycling cans on city sidewalks and see that they get emptied. The city will take requests for free cans on a case-by-case basis. "Philly being known as one of the dirtiest cities has always bothered me," said Councilman Mark Squilla, chair of Council's Streets Committee and the bill's sponsor. In 2012, Travel + Leisure named Philadelphia the nation's sixth dirtiest city. The bill developed from the city's studies of people's behaviors relating to trash: An "anonymous" city trash can on a corner gets abused with household trash, city officials said; when it appears that residents are keeping their eyes on the cans, people often treat them differently. In the past, city officials said, approvals for trash cans to neighborhood groups were typically "one-offs with Council." The city's plan is "giving property owners one additional tool to be able to deal with these [litter] issues on their own," McConnell said. "This fits into a larger conversation around the city's policy around litter and trash and whether we have the adequate resources to address them. And clearly we don't, because we have a persistent problem." Squilla said he hopes "more and more people will have interest and partner with the city to help us keep it clean." But Monica King, chair of the beautification committee at the Fishtown Neighbors Association, doesn't see how the city can expand the concept that the association's Feed the Fish program started four years ago. Placement of the cans is driven by the supply and location of volunteers, not need. Association members have spent hundreds of hours coordinating with the city and with residents, business owners, and the artists who designed the fish heads for the trash cans. Making the openings smaller than those of normal trash cans is meant to deter deposits of bulk trash. Initially, the association struggled to find the right contacts at the Streets Department, King said. The neighborhood relied on grants from the SugarHouse Foundation and through Paul Kimport, co-owner of Johnny Brenda's and president of the business association, Fishtown Co.
"We're a well-funded, well-coordinated, all-volunteer civic association," said King, 27, a program director at the University of Pennsylvania. What about communities with less active and well-funded neighborhood groups? she said. And what happens if the steward of a trash bin can no longer take care of it? Nic Esposito, Zero Waste and Litter director in the city's Managing Director's Office, said he knows the bill isn't a cure-all. "This is a piece of a puzzle," he said. Residents' putting household trash or bulky items, such as mattresses, in and around the cans frustrates both the city's Streets Department and residents, and the city hopes the agreements help fix the problem. "There are residents who beg us for cans," he said, "and they're begging us a month later to take them away, because they get dumped on."